For the American author, see William Norman Grigg. For the fictional character, see Will Griggs. William Donald Grigg (born 3 July 1991) is a professional footballer who plays as a striker for Sunderland. He represents Northern Ireland at international level. Grigg began his professional career at Walsall and came to prominence during the 2012–13 season, winning the club's Player of the Season and Players' Player of the Season awards. Grigg was born in Solihull, West Midlands. He was educated at Solihull School and was signed by Birmingham City at the age of seven. He progressed through the club's youth teams, but suffered a broken leg at age 15. After his release by Birmingham in 2007, Grigg became a student at Solihull College and turned out for Solihull Moors' youth team. In September 2007, Grigg signed non-contract terms with Midland Alliance side Stratford Town and made his first team debut in a 0–0 FA Cup qualifying draw versus Hednesford Town on 15 September. He started the replay and was substituted after 58 minutes for Steven Ruck. Grigg scored in a league match versus Biddulph Victoria on 29 September and again versus Racing Club Warwick on 7 October. Having courted interest from West Bromwich Albion, Grigg signed a scholarship at League One side Walsall in the summer of 2008. Assigned the number 24 shirt, he made his league debut as an 89th-minute substitute for Dwayne Mattis in a 0–0 draw with Cheltenham Town on 20 December 2008. Grigg was an unused substitute for a 2–1 defeat away to Tranmere Rovers on 28 December 2008 and made no further appearances in the first team squad during the 2008–09 season. Grigg made no appearances during the 2009–10 season, but was an unused substitute on 20 occasions. Grigg featured regularly as a second-half substitute during the 2010–11 season and made his first start for Walsall in a 1–0 FA Cup second round defeat at Torquay United on 27 November 2010. He made his first league start in a 1–0 away win against Charlton Athletic on 12 December 2010. He scored his first senior goal in a 2–2 league draw against Bristol Rovers on 11 January 2011. Grigg finished the 2010–11 season having made 30 appearances and scored 4 goals. Grigg made 32 appearances and 4 four goals during the 2011–12 season. Grigg became a regular starter during the 2012–13 season and scored seven goals before the New Year, including a brace in a 4–2 away victory over Milton Keynes Dons on Boxing Day. Grigg started 2013 in style with a goal, an assist and his first professional Man of the Match award in Walsall's televised league match against Portsmouth on 4 January. His impressive form continued as he scored his first hat-trick in a 3–0 victory at Carlisle United on 26 February, bringing his season tally up to 14 goals. He finished the 2012–13 season with a run of 10 goals in 11 matches, as Walsall mounted an unsuccessful challenge to qualify for the League One playoffs. Grigg's form led to interest from Championship side Derby County and Premier League sides Aston Villa, Southampton and Norwich City. Grigg won the Walsall Player of the Season and Players' Player of the Season awards for the 2012–13 season, having made 45 appearances and finished as the club's top scorer with 20 goals. Grigg's contract expired at the end of the season and he left the club after turning down a new four-year deal. He finished his Walsall career having made 109 appearances and scored 28 goals. On 1 July 2013, Grigg signed for fellow League One side Brentford on a three-year deal. As Grigg was under 24 at the time of the transfer, the deal went to a Football League tribunal and Brentford were ordered to pay an initial £325,000, plus add-ons. By July 2014, the fee had risen to £405,000. Grigg made his debut for the club in the first match of the 2013–14 season, a 1–1 away draw at Port Vale on 3 August 2013. On his next appearance, he scored his first Brentford goals, a brace in a 3–1 home victory over Sheffield United on 10 August. Injury, international call ups and being played out of position by manager Uwe Rösler led to Grigg enduring a stuttering start to his Brentford career and he admitted suffering a dip in confidence. He went 10 matches without a goal, until he was retrospectively credited with Brentford's second in a 3–2 win over Peterborough United on 26 November. In the following match, he scored the winner in a 1–0 league victory over Notts County. Grigg scored his fifth Brentford goal against Port Vale on 11 January 2014, scoring late in the second half after coming on for Sam Saunders. In March and still behind Clayton Donaldson and Marcello Trotta in the pecking order, Grigg told the Hounslow Chronicle "I haven't become a bad striker overnight. I've been training well, I'm confident and keep believing. If I get a run of games, I think I will always score goals". Grigg made regular appearances in the latter stages of a successful season in which Brentford secured automatic promotion to the Championship, but he was unable to find the net and finished the campaign with 36 appearances and 4 goals. Grigg departed Griffin Park on loan for the duration of the 2014–15 season and left the club on 14 July 2015. On 18 July 2014, it was announced that Grigg had joined League One side Milton Keynes Dons from Brentford on a season long loan. Manager Karl Robinson stated that Grigg is "a goalscorer at this level and he's a Northern Ireland international too. He's got the pedigree to come in and do well". Grigg scored on his debut for the club, levelling the score at 2–2 in an eventual 4–2 win over Gillingham on the opening day of the 2014–15 season. After three further appearances without scoring, Grigg put on a man of the match performance in a League Cup second round match versus Manchester United on 26 August, scoring a brace in a shock 4–0 victory. The match kick-started Grigg's season and he went on to score three goals in his next six matches, to take his tally to five goals in seven matches. Grigg hit his next patch of regular goalscoring form in mid-March 2015, scoring nine goals in eight matches to help consolidate the Dons' third place in the table. His four goals in two matches over the Easter Weekend saw him named in the Football League Team of the Week. On 28 April, Grigg was presented with the Dons' Goal of the Season and Top Goalscorer awards. He finished the season with a goal in a 5–1 rout of Yeovil Town, which confirmed a second-place finish for the Dons and automatic promotion to the Championship, ahead of fellow contenders Preston North End. Grigg scored 22 goals in 50 appearances during the 2014–15 season. On 14 July 2015, Grigg signed for newly relegated League One club Wigan Athletic on a three-year contract for an undisclosed fee, reported to be "around £1 million". Grigg scored his first goal from the penalty spot in a 2–1 defeat to Bury in the League Cup first round. Grigg scored his first hat-trick for Wigan in a 3–0 victory over Port Vale on 30 January 2016. 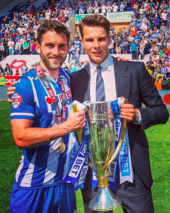 Will Grigg with chairman David Sharpe, pictured with the Division Three trophy after winning it with Wigan Athletic during the 2015-16 season. Grigg scored 25 League goals during the 2015–16 season, finishing as League One's top goalscorer, to help Wigan earn automatic promotion. His performances earned him a tied 25th place in the initial voting process for the UEFA Best Player in Europe Award after the 2015–16 campaign. On 19 February 2018, Grigg scored the only goal in Wigan's 1–0 home win against Manchester City in the FA Cup fifth round. This brought his total FA Cup goals for the season to seven, including four goals against top-flight opposition, making him the leading scorer in the season's FA Cup (from the first round onwards). Grigg signed for Sunderland on transfer deadline day, 31 January 2019. Grigg made his debut for the Tyne and Wear club on 9 February where they drew 1–1 away to Oxford United in the league. On the 19th Grigg scored his first goal for his new club in his 4th appearance slotting in a penalty to take Sunderland into a 3–2 lead over Gillingham. The match eventually finished 4–2. Grigg's goal put Sunderland 1–0 ahead of home side Bristol Rovers in the EFL Trophy semi final on 5 March. Sunderland travel to Wembley in the final after winning 2–0. The other goal coming from Lewis Morgan. On 31 March Grigg started in the 2019 EFL Trophy Final against Portsmouth, he was subsitited off in the 77th minute with Sunderland 1–0 up through a Aiden McGeady goal. However, the match finished 1–1, (2–2 AET) and Portsmouth won 5–4 on penalties. He has represented Northern Ireland at U19, U21 and senior level. He scored on his U21 debut after coming on as a substitute against San Marino in a UEFA U21 European Championship Qualifier on 3 September 2010 and earned his first senior cap in a 6–0 defeat to the Netherlands in a friendly on 2 June 2012, playing the full 90 minutes. After a further five friendly and 2014 World Cup qualifying appearances, Grigg failed to win a cap between October 2013 and March 2015, but his good form for Milton Keynes Dons earned him a start in a friendly versus Scotland. He played 58 minutes of the 1–0 defeat, before being substituted by Paddy McCourt. On 18 May 2016, Grigg was selected as part of the provisional 27-man squad to represent Northern Ireland in the UEFA Euro 2016 competition. On 28 May, he was named in the final 23-man squad, but ended up not playing a single minute throughout the tournament. In May 2016, Wigan Athletic supporter Sean Kennedy uploaded a video to YouTube titled "Will Grigg's on fire", which featured a song written in recognition of the recent goal-scoring feats of Grigg with the chorus to "Will Grigg's on fire, your defence is terrified" sung to the tune of "Freed from Desire" by Italian singer Gala. Since it was uploaded, the song has become a very popular football chant and a national sensation. Kennedy received a free Wigan season ticket from the Wigan chairman David Sharpe for the 2016–17 season as a result of success of the chant. On 31 May 2016, Electro duo Blonde released a version of the song and entered the Charts and the iTunes top 10 songs. As of match played 8 September 2018. Northern Ireland score listed first, score column indicates score after each Grigg goal. ^ a b c "Will Grigg". Barry Hugman's Footballers. Retrieved 3 March 2016. ^ "Solihull School – Sport". solsch.org.uk. Archived from the original on 8 July 2015. Retrieved 7 July 2015. ^ a b c d "MK Dons bag Brentford's Will Grigg, Transfer, Striker". Retrieved 26 November 2014. ^ a b Halford, Brian (14 November 2010). "Walsall youngster Will Grigg gets a German lesson in big-time football". Birmingham Mail. Retrieved 23 April 2014. ^ "Solihull College". solihull.ac.uk. Retrieved 7 July 2015. ^ "Football: Rookie Striker Will Grigg Is Ready to Spearhead Stratford". highbeam.com. Archived from the original on 10 June 2014. Retrieved 15 June 2015. ^ "Statistics". Hednesford Town. 19 September 2007. Archived from the original on 12 December 2013. Retrieved 23 April 2014. ^ "Football: Will's a star of future. – Free Online Library". Thefreelibrary.com. 29 September 2007. Retrieved 23 April 2014. ^ "Football: SUPER-SUB GRIGG FIRES STRATFORD; MIDLAND ALLIANCE. – Free Online Library". Thefreelibrary.com. Retrieved 23 April 2014. ^ "National Football Centre". Non League Daily. Oldnonleaguedaily.com. Archived from the original on 27 August 2014. Retrieved 23 April 2014. ^ a b c "Grigg Rejects Walsall in Favour of Bees Switch – Paperblog". En.paperblog.com. Archived from the original on 13 December 2013. Retrieved 23 April 2014. ^ "Cheltenham 0 Walsall 0 – verdict". Express & Star. Retrieved 22 December 2008. ^ "William Grigg Player Profile – ESPN FC". espnfc.com. Retrieved 7 July 2015. ^ "BBC Sport – Football – Charlton Athletic 0–1 Walsall". BBC News. 12 December 2010. Retrieved 23 April 2014. ^ "BBC Sport – Football – Bristol Rovers 2–2 Walsall". BBC News. 11 January 2011. Retrieved 23 April 2014. ^ a b "Games played by Will Grigg in 2010/2011". Soccerbase. Centurycomm. Retrieved 3 March 2016. ^ a b "Games played by Will Grigg in 2011/2012". Soccerbase. Centurycomm. Retrieved 3 March 2016. ^ "BBC Sport – MK Dons 2–4 Walsall". BBC. 26 December 2012. Retrieved 23 April 2014. ^ David Scriven (4 January 2013). "npower League One – Walsall vs. Portsmouth – 04/01/2013 | Pixel8 Photos – Editorial Sports Photography". Pixel8photos.photoshelter.com. Archived from the original on 15 October 2014. Retrieved 23 April 2014. ^ Scott, Ged. "BBC Sport – Walsall 2–0 Portsmouth". BBC. Retrieved 23 April 2014. ^ "BBC Sport – Carlisle 0–3 Walsall". BBC. 26 February 2013. Retrieved 23 April 2014. ^ a b c "Games played by Will Grigg in 2012/2013". Soccerbase. Centurycomm. Retrieved 3 March 2016. ^ "Will Grigg being watched by Aston Villa |Sport|Football". The Sun. 5 April 2013. Retrieved 23 April 2014. ^ Witcoop, Darren (17 March 2013). "Transfer news: Southampton and Norwich track Walsall striker Will Grigg PLUS Canaries line up move for Birmingham's Chris Burke – Mirror Online". Daily Mirror. Retrieved 23 April 2014. ^ a b c "Grigg claims two awards". Sky Sports. Retrieved 15 June 2015. ^ "William Grigg | Age 22". Soccerbase. Retrieved 10 September 2018. ^ "Bees sign Will Grigg". Brentford F.C. 1 July 2013. Retrieved 6 July 2013. ^ "Will Grigg Tribunal". Brentfordfc.co.uk. Retrieved 23 April 2014. ^ Jacob Murtagh. "Brentford striker quashes Bristol City talk". getwestlondon. Retrieved 26 November 2014. ^ "BBC Sport – Port Vale 1–1 Brentford". BBC. 3 August 2013. Retrieved 23 April 2014. ^ "BBC Sport – Brentford 3–1 Sheffield Utd". BBC. 10 August 2013. Retrieved 23 April 2014. ^ Murtagh, Jacob (17 November 2013). "Rosler unhappy with Northern Ireland over Grigg treatment". Get West London. Retrieved 23 April 2014. ^ "Bees striker admits dip in confidence". West London Sport. 24 October 2013. Retrieved 23 April 2014. ^ Chris Wickham. "WILL GRIGG CREDITED WITH POSH GOAL". Retrieved 26 November 2014. ^ "BBC Sport – Notts County 0–1 Brentford". BBC. 30 November 2013. Retrieved 23 April 2014. ^ "BBC Sport – Brentford 2–0 Port Vale". BBC. 11 January 2014. Retrieved 23 April 2014. ^ Murtagh, Jacob (28 February 2014). "'I haven't become a bad striker overnight!' Bees striker Grigg champing at the bit". Get West London. Retrieved 23 April 2014. ^ a b "Games played by Will Grigg in 2013/2014". Soccerbase. Centurycomm. Retrieved 3 March 2016. ^ a b Wickham, Chris. "Will Grigg joins Sky Bet League One Wigan Athletic from Brentford for undisclosed fee". brentfordfc.co.uk. Retrieved 14 July 2015. ^ "BBC Sport – Milton Keynes Dons 4–2 Gillingham". BBC Sport. Retrieved 26 November 2014. ^ Chris Osborne. "BBC Sport – Milton Keynes Dons 4–0 Manchester United". BBC Sport. Retrieved 26 November 2014. ^ a b c d "Games played by Will Grigg in 2014/2015". Soccerbase. Centurycomm. Retrieved 3 March 2016. ^ Statto Organisation Ltd. "Milton Keynes Dons Table on Tuesday 7th April 2015". Statto.com. Archived from the original on 8 July 2015. Retrieved 15 June 2015. ^ Alex Butcher. "Sky Bet Football League Team of the Week". The Football League. Retrieved 15 June 2015. ^ "Baker bags Player of the Year award!". mkdons.com. Retrieved 15 June 2015. ^ "BBC Sport – Milton Keynes Dons 5–1 Yeovil Town". BBC Sport. Retrieved 15 June 2015. ^ "Grigg completes Latics switch". wigantoday.net. Retrieved 15 July 2015. ^ "Wigan 1–2 Bury". BBC Sport. 12 August 2015. Retrieved 11 August 2015. ^ "Wigan Athletic 3–0 Port Vale". BBC Sport. Retrieved 3 March 2016. ^ "League One Top Scorers". BBC Sport. Retrieved 31 May 2016. ^ "Wigan Athletic 1–0 Manchester City". BBC Sport. 19 February 2018. ^ "Wigan Athletic v Southampton". BBC Sport. 16 March 2018. Retrieved 17 March 2018. ^ "Will Grigg: Sunderland sign striker from Wigan for £4m". 1 February 2019 – via www.bbc.co.uk. ^ "Oxford United 1-1 Sunderland - BBC Sport". 9 February 2019 – via www.bbc.co.uk. ^ "Sunderland 4-2 Gillingham - BBC Sport". 19 February 2019 – via www.bbc.co.uk. ^ "Bristol Rovers 0-2 Sunderland: Wearsiders through to Chackatrade Trophy final - BBC Sport". 5 March 2019 – via www.bbc.co.uk. ^ "Checkatrade Trophy final: Portsmouth 2-2 Sunderland (aet, 5-4 on pens)". 31 March 2019. Retrieved 2 April 2019. ^ Zidane (5 September 2010). "Goalscoring Saddlers for Northern Ireland's U21". Walsall Web-Fans. Archived from the original on 23 April 2014. Retrieved 23 April 2014. ^ Jackson, Lyle (2 June 2012). "BBC Sport – Netherlands 6–0 Northern Ireland". BBC. Retrieved 23 April 2014. ^ a b c d "W. Grigg". Soccerway. Global Sports Media. Retrieved 3 March 2016. ^ Richard Wilson. "BBC Sport – Scotland 1–0 Northern Ireland". BBC Sport. Retrieved 15 June 2015. ^ "Northern Ireland Euro 2016 Squad". The Daily Telegraph. Telegraph Media Group Limited. 18 May 2016. Retrieved 21 May 2016. ^ "DALLAS HEADING TO THE EUROS". LUFC Official. Leeds United Official. 28 May 2016. Retrieved 28 May 2016. ^ "Euro 2016: Will Grigg disappointed with NI omission – BBC Sport". BBC. 27 June 2016. Retrieved 26 July 2016. ^ a b Davis, Callum (17 May 2016). "'Will Grigg's on fire!' Fan behind the cult chant given a free Wigan season ticket". The Daily Telegraph. Retrieved 30 May 2016. ^ "'Will Grigg's on fire' parody earns Wigan fan a free season ticket". BBC Sport. Retrieved 23 May 2016. ^ "Will Grigg's on fire, the singles chart is terrified as Blonde's version of the Wigan terrace chant closes in on iTunes top 10". Daily Mail. Retrieved 31 May 2016. ^ "Games played by Will Grigg in 2008/2009". Soccerbase. Centurycomm. Retrieved 3 March 2016. ^ "Games played by Will Grigg in 2009/2010". Soccerbase. Centurycomm. Retrieved 3 March 2016. ^ "Games played by Will Grigg in 2015/2016". Soccerbase. Centurycomm. Retrieved 9 May 2016. ^ "Games played by Will Grigg in 2016/2017". Soccerbase. Centurycomm. Retrieved 4 September 2016. ^ "Games played by Will Grigg in 2017/2018". Soccerbase. Centurycomm. Retrieved 12 May 2018. ^ "Games played by Will Grigg in 2018/2019". Soccerbase. Centurycomm. Retrieved 24 September 2018. ^ a b "Grigg, Will". National Football Teams. Benjamin Strack-Zimmerman. Retrieved 6 September 2016. ^ Jackson, Lyle (27 May 2016). "Northern Ireland 3–0 Belarus". BBC Sport. Retrieved 6 September 2016. ^ Anderson, John, ed. (2018). Football Yearbook 2018–2019. London: Headline Publishing Group. pp. 382–383. ISBN 978-1-4722-6106-9. ^ "PFA League One Team of the Year: Wigan & Blackburn quartets included". BBC Sport. 18 April 2018. Retrieved 7 May 2018. ^ "Will Grigg wins PFA Fans' League One Player of the Season award". Sky Sports. 25 May 2016. Retrieved 5 September 2018. ^ "Will Grigg named Sky Bet League 1 Player of the Month". The Football League. Retrieved 10 October 2017. ^ "Player of the Month: Will Grigg – Wigan Athletic". EFL. 4 May 2018. Retrieved 5 September 2018. This page was last edited on 23 April 2019, at 12:35 (UTC).